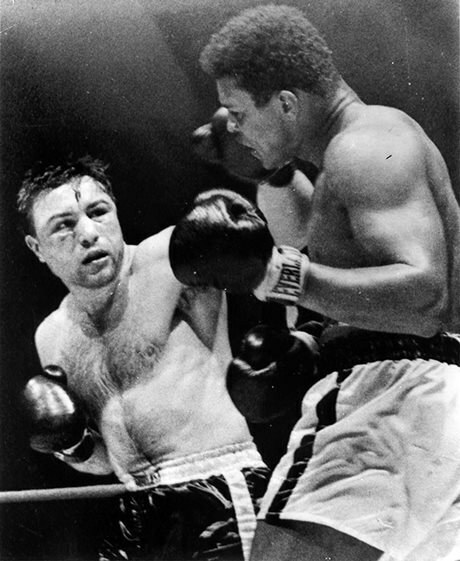 Canadian heavyweight champion George Chuvalo famously fought Muhammad Ali and was never knocked down by the boxer. The son of working class Croatian parents, Chuvalo entered boxing at an early age, turned professional in 1956 and won a heavyweight tournament that year at Maple Leaf Gardens. He knocked out James J. Park in September 1958, and was crowned the Canadian Heavyweight Champion. Chuvalo first fought Ali in March 1966. Although he lost the match, he proved his skill as a fighter, and became a national hero by standing up against Ali for 15 rounds without going down. The two had a rematch on May 1, 1972, in Pacific Coliseum in Vancouver. It was a similar result after 12 rounds, as Ali won, but Chuvalo was never knocked off his feet. He was inducted into Canada’s Sports Hall of Fame in 1990. Watch the documentary The Last Round on Ali and Chuvalo’s fights. Listen to Chuvalo fight Ali in Maple Leaf Gardens from the CBC Archives. Read more about Chuvalo on the Ontario Sports Hall of Fame website.